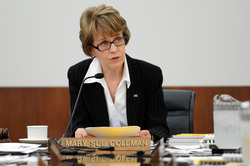 Posted on Thu, Jan 19, 2012 : 11:14 a.m.
What does University of Michigan President Mary Sue Coleman consider her top accomplishments? How did she get the idea for the recent university plan to invest $25 million in university start-ups? What does she want her legacy to be after she's left office? What lured her to leave her post as a researcher and become an administrator? Coleman answered these questions and more during a recently released podcast with Ann Arbor SPARK CEO Paul Krutko. "I started my academic career as a very happy faculty doing biochemistry research and teaching and spent a long time at the University of Kentucky, (and) never really thought that I would do anything else other than be a faculty member. I loved that part of my life. But an opportunity opened sort of mid-career to try out some administration, first in the cancer center. What I discovered is that I really enjoyed the work and it was quite different." "It has such a fabulous reputation as a tremendous institution of great scholarly breadth and depth, it is just known world-wide. Ann Arbor is also seen as a very, very wonderful place to live. "Those were the main drivers in my interest, there ere not many places I would have left the University of Iowa for, but Michigan was one of them." "When I look at the list I think that the Residential Life Initiative, to really focus on the experience that students have outside of the classroom, because I'm a great believer that it's the holistic experiences that students have at college and a university setting that really make them what they become in their careers. So we hadn't done much with our residence halls in the previous 35 years, so when really started this it was a huge task. And I'm so proud of the fact that we have marched down the heritage halls and made them much more interesting in terms of intellectual engagement. "Beyond that I look at the purchase of the old Pfizer site. The development of the North Campus Research Complex is a once-in-a-lifetime opportunity, Universities never have the chance to purchse 2.2 milliion square feet of space and all this land at pennies on the dollar. And so for us it was just a tremendous, tremendous opportunity. "I've been so excited about our emphasis on economic growth and development, melding that with the curriculum entrepreneurship, really unleashing the power of our students and faculty in concert with the needs in the state. And so the ability to do that here and do it in a big way. I mean I think this opportunity here is bigger than most places and part of it is because Michigan's fallen so hard and we're having to go through this hard translocation. But the upside is huge. And so when you fall far you get a big upside potential. And that for me is what's so exciting." "I've just really enjoyed the exprience because I think what we've done is to heighten awareness of the necessity of innovation and entrepreneurship and that universities need to be part of the equation. Regents need to be part of it and that that's the only way we're going to win in the twenty-first century." "This was one of the most fun things because I had gotten this idea actually from a board member at CalTech (California Institute of Technology) and they had considered it. I don't think that they ever implemented it. And so he said to me you know what you ought to do is to go back and analyze, have somebody analyze the start-ups from your faculty in the last 20 years and those that got venture funding and just do a theoretical model that if you had invested at every round... what your return would have been. And so what we discovered is our returns would have been as good as the best venture funds we are in. "It's lumpy, but a return is lumpy and you have to look at it over time. You can't judge yourself every year because you'll have a lot of failures. The good thing about it though is you fail quickly. I mean, we don't have failures that drag out for years so you know they're washed out of the system very fast. And we had some real winners. "We may change that cap a little bit, if we get some real success, and make it higher. "We've gotten a lot of commentary around the country. You know I think few universities, if they do the analysis, would have as good a success as Michigan because one of our strengths is that we're very broad. We're not focused only in medical, we're not focused in engineering. We're everywhere and that gives us protection." "What I would hope is that in 10 years time we'll look back and say that this was really the time of the emergence of the entrepreneur in a sense of creating that kind of networking environment that we all envy so much from Silicon Valley. But just company after company after company and that there's always opportunity in this Ann Arbor region. "That we will have outgrown completely the existing space in North Campus Research Complex, that we're building new buildings, that we can't build them fast enough because there's so many exciting that ideas. So that's my hope and dream and I hope when people look back on this time and say you know what it all started in the tenure of Mary Sue Coleman." Sat, Jan 21, 2012 : 1:19 a.m.
#1... Secret Meeting with Rich-Rod! Thu, Jan 19, 2012 : 11 p.m.
Thu, Jan 19, 2012 : 10:46 p.m. Suggestion for inclusion in the poll: Knocking down the final bit of that inconvenient wall between independent intellectual/scientific inquiry and corporate lackeyhood. Thu, Jan 19, 2012 : 10:45 p.m.
Thu, Jan 19, 2012 : 10:25 p.m.
Dear President Coleman PLEASE consider helping the T. Wall Foundation as one of your top accomplishments. I am contacting you to ask for your help with a project which will be a win-win for the University of Michigan and the T. Wall Foundation. The T. Wall Foundation helps special children and families in need in Washtenaw County. Michigan Hockey Coach Red Berenson was quoted saying, "The T. Wall Foundation flies below the radar helping so many special need children in Washtenaw County." Since 2004 the T. Wall Foundation has operated a Special Hot Dog Stand just down the hill from Michigan Stadium. We would like to move the stand up the hill onto a small piece of vacant U of M property. I would like your help in getting the University to give us access. Our connection with the U of M is that most of our special children were or are patients at Mott Hospital from time to time. Although we are an entirely independent charitable foundation, our placement on the same level as the Stadium will further U of M's reputation of aiding people in need. Our staff includes Special volunteers with physical and cognitive disabilities including Autism, Down Syndrome, diabetes. Some are in wheel chairs. The latter are constrained by lack of space in our current location. We would like to enable them to be full participants in our enterprise. We also would like better proximity for our donated golf cart to carry people with mobility limitations to and from the Stadium. Thu, Jan 19, 2012 : 8:23 p.m. Becoming one of the nation's most highly regarded University President's - a resource for Congress, the President, other Universities, and educational associations who admire her skill and capabilities in advancing the educational and research mission of UofM and it's national reputation around the world. Fri, Jan 20, 2012 : 12:39 p.m. The three articles I mentioned included the Provost's. If you're content with the pronouncement from behind the curtain, all must be well in Oz. Fri, Jan 20, 2012 : 3:28 a.m.
As the Provost reported to the Regents, the Student was terminated due to academic performance issues and nothing to do with union issues. Please keep up with the news, you are behind current events. Ever faithful Sparty remains vigilant in the protection of the Michigan Difference. Curiously silent however on the now three articles regarding the allegation of Union Busting and the firing of the grad student. Usually one of the first out of the chute to defend Unions as well there seems to be some conflicting interests. Silence speaks volumes. Thu, Jan 19, 2012 : 8:19 p.m. I wonder where she ranks that drive down U.S 23 to Toledo with Bill Martin? Thu, Jan 19, 2012 : 5:08 p.m.
You would think fleecing the state would be at the top of that list.